Do companies need to build a diverse and inclusive workforce? Of course there are the moral reasons, yet, in addition many studies demonstrate the business case for diversity and inclusion. According to one study, inclusive teams outperform their peers by 80% in team-based assessments. This makes sense – hiring diversely leads to different perspectives, which in turn creates more diverse products and overall business. Additionally, when companies are inclusive, meaning actively adapting the culture and behaviors to respond to employees, then people will feel included. That’s why at Zendesk we work with The Arc San Francisco, an organization that serves adults with intellectual and developmental disabilities, to increase our company’s diversity and give populations with hiring barriers the opportunity to build their careers. The Arc is a lifelong learning and achievement center supporting over 700 individuals with developmental disabilities in San Francisco. With a mission to serve this population by promoting self-determination, dignity and quality of life, The Arc offers a variety of programs to help individuals achieve their personal goals. Individuals come to The Arc at different points in their personal growth and professional careers. There is programming to support individuals at each step in their lives with classes in three development areas: Adult Life and Skills, Employment Development, and Careers and Advancement; all of which aim to learn new skills or reinforce others at any stage of adulthood. Further, The Arc focuses on job training and placement teaching skills such as resume writing, computer and mobile skills, professional communication skills and professional conduct to individuals looking for employment. Today, almost 300 clients have found employment at top companies around the Bay Area with an average length of employment of seven years. Zendesk’s partnership with the Arc began five years ago when we first hired a client of The Arc, Eric, on our Workplace Experience team helping with office services. Since 2011, a lot has changed at Zendesk but Eric is still here as one of our most committed employees. In the spring of this year, we worked with the Arc to hire Casey to our IT team where he maintains the conference rooms and makes sure they are working properly -- no easy task between our two buildings. Both Eric and Casey have been invaluable to their teams, providing essential work, boosting moral and contributing to a more inclusive work environment. 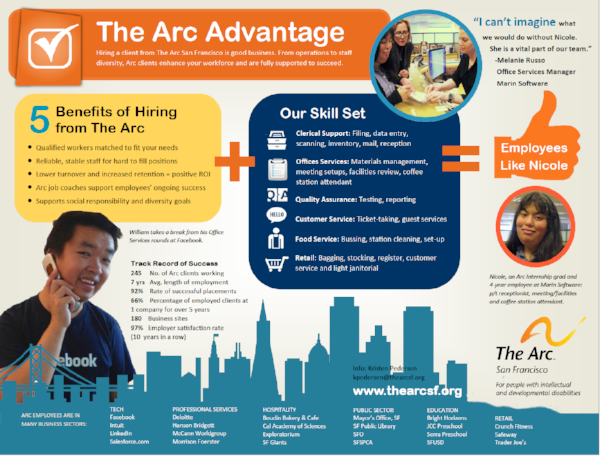 Interested in hiring a client from the Arc? The Arc minimizes all barriers to hiring a client through pre-employment preparation, on-site job coaching, and ongoing support to the client and team. For more information about The Arc San Francisco Employment Services contact Kristen Pedersen, Director of Employment and Education Programs, at kpedersen@thearcsf.org.